I confess that I roll my eyes a bit at the overhearing of some new truffle recipe. I don’t mean to over-simplify them — yes, fabulous chocolatiers from time to time find new ways to flavor, construct or adorn these decadent orbs of Awesome — but it all simmers down to the same thing: they’re just firm ganache, and ganache is just melted chocolate mixed with cream. 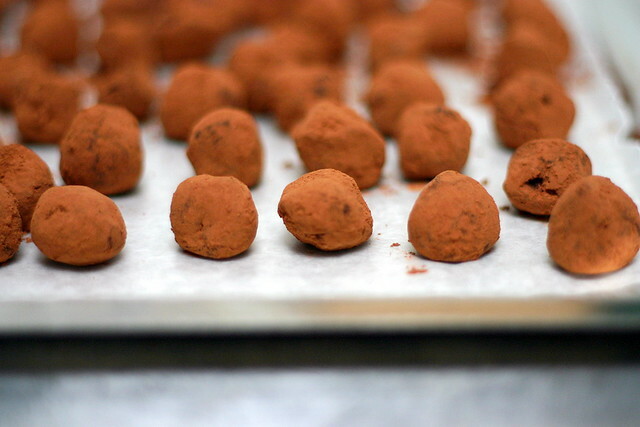 If you, like us, feel that tiny truffles are nothing short of the most transcendent and uplifting vehicle for chocolate consumption, you should make them because they’re ridiculously easy. Plus, unless you’re buying yours at $2.50 apiece, they’re pretty much always better homemade. Pour some boiling heavy cream over chopped bits of chocolate in a bowl in an approximately 1:1 ratio, as in once ounce tablespoon of cream to one ounce of chocolate. Whisk them together. Add your flavorings of choice — a flavored liquor, splash of extract, spoonful of coffee, pinch of spice or some combination of the above — let it firm up in the fridge, either scoop out pieces or pipe it into mounds, then rolling it into your topping of choice, pop one in your mouth and say aaah. Why the big demystification today? Because I finally made some, and really, rolled my eyes at myself for not doing it sooner. All this means is that I no longer have an excuse not try out The Great Robert Linxe’s delights. Still, latex gloves? Inherently scary. Four more things: I used Ina Garten’s hazelnut truffle recipe, because I just love those flavors together but obviously you could replace that liqueur with any other for a flavor you’d prefer. I rolled them in unsweetened cocoa instead of chopped nuts out of personal preference, but anything from coarse sugar, chocolate shavings, ground candy canes to small sprinkles could make these more festive and less, er, discomforting in their appearance. Finally, although we have all noted before how tiresome it is when a recipe implores us to use “good” this or “quality” that, since truffles are nothing but a magnifying glass for chocolate, the expensive stuff really comes through when you make these, in a way that Nestle’s toll house chips will not. Prices making you ill? Replace just half with the gourmet treats. Finally, I did the scoop and roll in your hands thing but I’m totally piping them next time. Seems less messy and I love that little mounded shape. Alas, I am not even close to done cooking or posting for the weekend, but I suspect most of you are done reading. Have a fantastic, relaxing and delicious holiday; I’ll be right here when you get back. Chop the hazelnuts and place them on a sheet pan. Roast them in the oven for 10 minutes. (If the hazelnuts have skin on them, roast them for 25 minutes.) Set aside to cool. Chop the chocolates finely and place in a bowl. Heat the cream in a small saucepan until it boils. Immediately pour the hot cream through a fine-meshed sieve into the bowl with the chocolates. With a wire whisk, slowly stir the cream and chocolates together until the chocolate is completely melted. (If the chocolate doesn’t melt completely, place the bowl over a pan of simmering water and stir for a few minutes just until it melts.) Whisk in the hazelnut liqueur, coffee, and vanilla. Cover and chill for 45 minutes to 1 hour until pliable but firm enough to scoop. With 2 teaspoons or a 1 1/4-inch ice cream scoop, make dollops of the chocolate mixture and place on a baking sheet lined with parchment paper. Refrigerate for about 15 minutes, until firm enough to roll into rough spheres. Roll the chocolate in the chopped hazelnuts and chill again. Do ahead: Truffles are best when they’re allowed to set overnight in the refrigerator. ahhh someone went to the container shop! Im a milk chocolate girl. any idea how to make them more milk chocolatey? oh, I’ll probably be around to read more! Deb, I love making truffles and my friend Jen (yes, we’re double Jen trouble) and I took a chocolate class to get some new skills. We love to add various liqueurs and flavors to the truffles. I had someone bring me chocolate from Belgium so I can indulge him! And donÃ‚Â´t worry, IÃ‚Â´ll be around to read your adventures because even though I am at my parentsÃ‚Â´ house hours away from becoming a “grandma”, I have my laptop with me, so I keep up with my daily reading. Those look so yummy and dangerous to have around. Anything bite size and chocolate is to tempting. Thanks for such a sweet send off to the holiday weekend. Who knew truffles could be so sinfully simple to make? Happy Holidays to you and Alex! I’m not sure I’ll ever be done reading your site. Happy Holidays! Hi Deb — these look perfect! Bet they taste chocolicious, too. I was reading the recipe and if I’m adding right you have 7 oz. chocolate and 4 oz. cream. It doesn’t work out as a 1:1 ratio. ??? I made these tonight…they, well, they melted in my hands as I was trying to roll them out. They ended up being little balls with the coating mixed in. I ran my hands under FREEZING water before I rolled, I rechilled, they kept melting and turned into a mess. Deb…what did I do wrong? They tasted great, but looked like something my cat would leave me as a present…in her litter box. Help??? I have had some different spiced ones and maybe I am a chocolate purist, but they just didn’t work for me. Dark chocolate all the way, I say. Plain. And easy, heck yeah! A classmate of mine in the wine class was talking to me about wanting to make them but being nervous about it. I gave her recipes we used in culinary school and on the last night of our wine class she brought in a whole container of them just beaming. She proudly told me all about how her and her mom did it. It was great! You have a delicious holiday too Deb! Don’t quit…please don’t quit…I’m looking to your posts to help me retain my sanity as I spend a week with my mother-in-law in close confines!!! Merry Christmas!!!! Hey Deb- Great looking truffles! It looks soo drool-worthy good! :p I used to make tons of truffles when I was in high school but fast forward five years, I haven’t made one, just consume a lot of them. Hmmm…your post is motivating me to make some! Well, actually I’m baking cheesecake, so maybe for New Year’s. 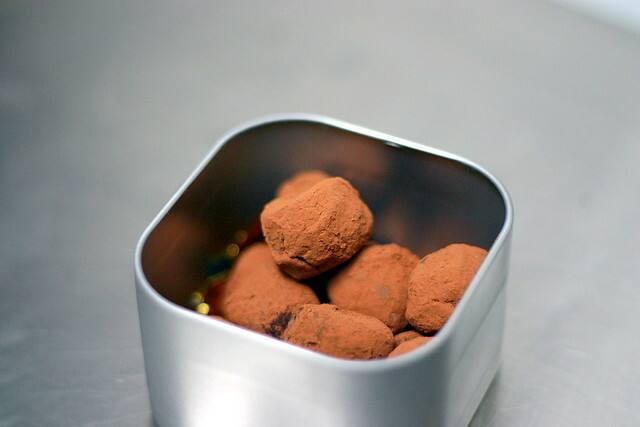 I’d love to receive a little beautiful tin like that, full of delicious truffles. It looks like I’ll be away after all — at least this weekend. Sob! I have much to tell you, there’s been gourgeres and Russian tea cakes and a new a fantastically unhealthy stuffed mushroom recipe, gah. Also, we need to help me come up with foods that my dear Jocelyn can eat when her family springs her from the hospital this weekend to save her from an all Cream of Wheat diet. Cupcakes – I’m sure milk chocolate would work, but I’d use less cream as it is already creamier. Don’t have any proportions readily available right now, however. Marie – You are utterly correct. 1 cup of cream is 8 ounces, 1 pound of chocolate is 16 ounces (somewhere in Europe, someone is pulling their hair out that our measurements are so whack), so that ratio would actually be 1:2. I will have to fix later, as I am v. late to go already! Have a great weekend! Merry Christmas! Oh no, I was looking forward to posts! Anway, I’m definitely making these for Valentines Day, or maybe sooner. What brand chocolate did you use? I made your cranberry sauce for Christmas Day since my cousin gave me this task (the one with the orange in it), and it came out so good! I never liked cranberry sauce very much either, but this is great. Thank you! I was going to make your blondie recipe too, but I wimped out. Actually, I think we will have SO many cookies and cheesecake that I’m going to save it for New Years (I have the ingredients ready!). What kinds of foods can Jocelyn eat? I just had my gall bladder out, so am also on bit of a limited diet. Tell us what her limitations are and we’ll figure something out! Deb — sorry to hear about Jocelyn. She’s blessed to have you to hold her hand. Re recovery food. There’s a reason cream of wheat, jello, chicken soup, et al, are the menu favorites. After surgery or a bad cold, the taste buds are affected. Nothing tastes good. Although you coould try truffles. Chocolate or the real deal. Like pasta with cream, egg yolks, parmesan cheese and a shaving of black truffles. Jacques Torre’s (Epicurious) recipe is more of a 1:1 ratio. But, in the comments dept. someone who tried it said it wouldn’t set up and she cut the cream in half and then it worked. healthy, happy New Year. To everyone — Peace on Earth, Goodwill to Men. You’re right – homemade truffles are the best. I plan to make some Oreo ones tomorrow – new recipe! I’ll have to let you know how they turn out. Happy Holidays, Deb. I’ve enjoyed your writing and recipes so much this year. I hope you and your family have a blessed New Year, too. i doubt highly that my reading habits will change over the weekend…thanks deb. i am up in wilton,new hampshire and i just wanted to tell you that i love your blog which i stumbled upon tonight in my flurry to figure out the best way to seal a pierogi, which, when googled, brought me here. (mushroom pierogi recipe from last month). it’s about 1 am and i, like many, many before me, am up cooking and wrapping for christmas. i just finished making about 15 dozen pierogi, the old fashioned way, with the sour cream dough and the potatoe, onion and cheese filling. took me forever and some of them look stunted, abused and malformed, but heh, having a 3 year old crimping them with a nemo fork, i guess you’ll have that…what a great idea with the wontons though!! i’m gonna try your recipe as soon as the hoopla is done around here. Because I am such a saddist I am going to help my mom and sister make these tonight. Even though it would send me straight back to the hospital if I ate one. Good to be back! Merry Christmas, Happy Hanukkah, Happy New Year. Blah Blah! Ina’s truffle recipes are the best. Before I discovered her basic truffles, I’d been afraid to make them. Oh, so easy! I tried them with kids in my cooking class, and they were absolutely delicious. I used Sharffen Berger chocolate for these and they were incredible. Next time I would do the cocoa instead of chopped nuts though. They look much prettier. As for the melting in the hands, I experienced that too but assumed it was all part of making truffles. They turned out fine after I rechilled them. I tried the Barefoot Contessa recipe, thought they were OK. I guess after becoming a good-chocolate addict, I can’t go back. I do spend, I think it’s $1-$1.5 per truflle at Frans’ chocloate in Seattle. Lately I discovered Theo chocolate truffles which are even better (and more expensive). So I’m in real real trouble. But am keeping this addiction under control and only buying a few truffles every other month or so, and eating them SLOWLY. Hi Deb and Happy New Year. The tuffles taste grate! The problem is that they are never hard enough, even straight from the freezer, when I peeled them from the parchment paper. About 2 thirds of them I coated in melted chocolate like in your link to the Robert Linxe’s truffles, or your other truffles from this site. They set beautifully and made a grate gifts. But coating them at 1 AM I said enough at some point, and about 1/3 of them just took a bath in the cocoa powder and went to the fridge. They hold their shape, but just to the point that you try to pick one up. Any ideas (except for going back to coating them in chocolate over the cocoa)? i’ve made these several times and love them. i used raspberry liquer once….almond liquer another time..and another time using tequila, with a little bit of lime juice. amazing. We’re doing the White Elephant game for Christmas this year with a $5 gift limit. So instead of buying a gift, I tried your truffle recipe. Frangelico was a little expensive, so I substituted it for Amaretto. They turned out perfect! Thank you for all the terrific recipes! I made your truffles today for my friends as Valentine’s gifts and they are SO delicious!!! I can’t wait to give them the gift of handmade chocolate :] I can’t wait to try more recipes from you :] Thank you! Truffles are AWESOME! I used chopped hazelnuts and B&B in the muxture then rolled them in chocolate sprinkles. YUM! I’m going to try white chocolate with Amaretto next. These look delicious! Just a quick question – is “prepared coffee” coffee? As in the liquid, after you’ve brewed it? Yes. It’s more of a heads up not to use instant coffee, which is often called for in baking. I would love to try this recipe but I cannot find frangelico. Can I use almond extract? Will the truffles taste the same? Hi Deb, Just a reminder to change the ratio of ounce to ounce to cup to pound in your recipe. Sadly I attempted an ounce to ounce ratio before reading the comments! Hopefully they can still be recovered with the addition of some more chocolate though! Eireann — Whoops! All fixed now. What I’d meant to say was roughly 1 tablespoon of cream to 1 ounce of chocolate. But why, pray tell, would you want to dilute the flavor of good chocolate with cream? I’d just eat the chocolate. More chocolatey! I used this recipe as is, but stuffed a toasted hazelnut in the middle of the truffle, and they’re pretty much to die for. I also used the basic ingredients, but swapped the liquor for 1/2 tsp peppermint extract. It appeared like the fat was separating, as it was all glossy, but I used a whisk once the chocolate was melted and it whipped into shape. Ina Garten did a video, and it showed a good tip. The chocolate takes a few minutes to melt, and if the coffee is hot, it shouldn’t need a double boiler. I didn’t realize this when I made them last year, but it would have saved me the hassle, if I had just waited. Varlhona chocolate bars sell for $3 at Trader Joes. Nicer than Guiradelli’s, but not terribly pricey, they’re a great choice for this dessert. Hi deb, just wanted to ask, do you store them in the refrigerator when made and do you leave them outta the refrigerator for a while before having one? Hi there. I am wondering how many truffles this recipe yields. Also, how long will truffles keep in the fridge? And are they freezeable? I’d like to make these in Nov to give away for the holidays in December if possible. Thanks for what looks like a great recipe! Dana — It should make about 20 truffles. I haven’t frozen them, but would expect them to freeze well.